I just want to point out in the second comic, last strip the dialogue tails are missing. Otherwise good job, still waiting for more. Who doesn't want to kill a helpless little girl. The Holy Kensai Fan Club! OMG WE BOTH HAVE SHINON. Same here bro! I feel the urge to make a comic about how I've gotten along here... because I can. Looking forward to more comics man. ARRRGH. MUST. STOP. BEING. LAZY. It's ok Arim. I've been there done that. Stops you from being lazy! Panel 1- Arim: So Lyn, where are we sleeping? Lyn: Hmm...That's a good question. Panel 3- Arim: We need to recruit someone with Gold. Lyn: Alright. Panel 4- *Gold And Leetofish walk by* Lyn and Arim: Perfect. Panel 5- Arim: Here's the deal. We need Gold, so we're recruiting you two. Gold: ....Huh? 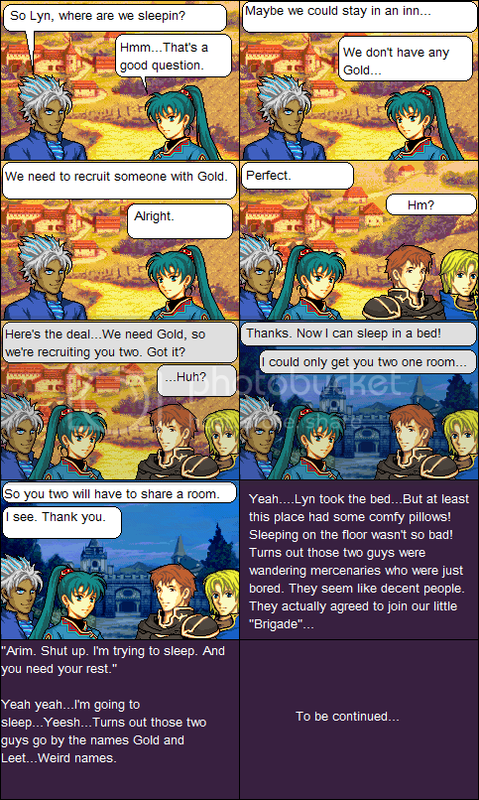 Panel 7- Gold: So you two will have to share a room. Lyn: I see. Thank you. Panel 9- Lyn: Arim. Shut up. I'm trying to sleep. And you need your rest. Arim: Yeah yeah...I'm going to sleep...Yeesh...Turns out those two go by the names Gold and Leet...Weird names. Recruiting just so you can steal their money? "We need someone with Gold!" I was half-asleepif not sleep walking when I made this! XD But yeah, I'll update the description now. Wait... descriptions? Or do you mean the dialogue that you post outside of the comic? I'll add the text tomorrow. But for now, write your interpretation of it when you comment! BTW Order is left to right, top to bottom.